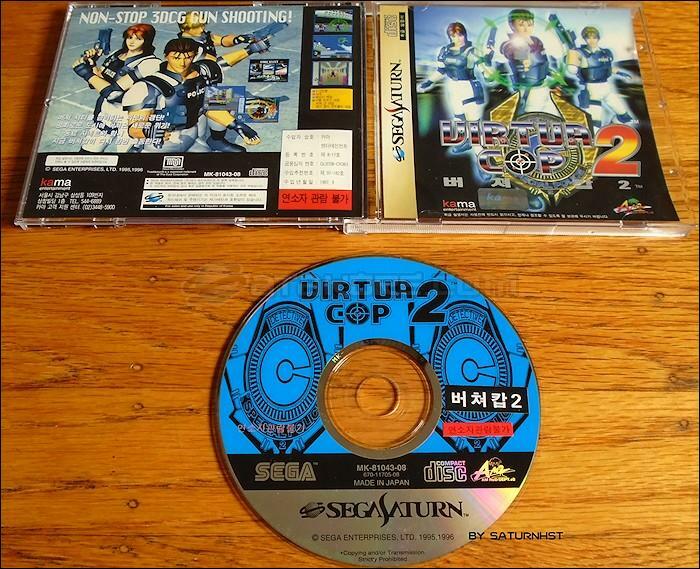 Virtua Cop 2 (버쳐캅２) is a Gun Shooter game, developed by Sega Enterprises, Ltd. and published by kama entertainment, which was released in South Korea in 1997 for the Sega Saturn. Guns are cool. Especially when you can use one to play a videogame. Virtua Cop 2 is thee lightgun game to have for the Sega Saturn. Since everything else was ported from either this or the first version on the Saturn, you obviously want to stick with this one. The Sega Saturn version of Virtua Cop 2 has mirror mode as well Virtua Cop 1 in the options menu. You can also choose game difficulty and calibrate whichever lightgun you may be using. Everyone recommends the Virtua Gun, but I managed to pick up a little rarity called the Thunder Gun by DVS which was banned immediately after being produced for looking too real. You can play a round of Virtua Cop 2 with this thing, and then go rob a convenience store. JUST KIDDING KIDS! Seriously though, Virtua Cop 2 has it all. The level of gameplay is as you wish with 3 different levels of difficulty, and the action is non-stop throughout. Although the graphics aren't the most cutting edge ever with lots of pixelation everywhere, the quality of gameplay and action more than make up for this shortcoming. I've said it once, I'll say it a million times: gameplay trumps graphics any day of the week. That's not to say VC2 is a nightmare, but it's nothing next generation by any means. One thing that really challenges the gamer is that your enemies vary greatly as to when they are going to shoot. Some will walk on the screen, start aiming and then fire, where others will be ready the split second they appear. There really is no room for error in VC2. Overall Virtua Cop 2 is a rock solid lightgun game with loads of replay value. Go get yourself a good gun and GAME ON!